Sony is no longer offering PSPgo consumers the option to obtain digital versions of all of the games they already own on UMD, backtracking on its original promise to do so. "We were evaluating a UMD conversion programme, but due to legal and technical reasons we will not be offering the programme at this time." So if you have a big pile of old games on UMD disc (and if not, why don't you have copies of WipEout, Ridge Racer, Lumines?) 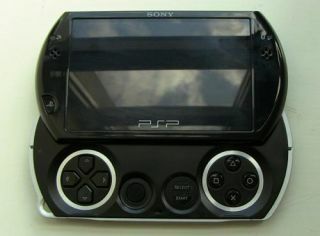 you are only going to be able to play them on the bigger, older models of PSP. Sony Computer Entertainment Europe is at least offering the conciliatory olive branch of a choice of three of 17 recent PSP games available as digital downloads to European gamers that already own the UMD versions, providing they own at least one UMD game. The 17 titles to choose from include Echochrome, LocoRoco, Patapon, Resistance: Retribution and WipEout Pure. "The inability to play games you've already bought on UMD, combined with the high-price point of the console, seems like a compelling reason not to upgrade to PSPgo," said PSM3 magazine's Associate Editor Andy Hartup. "Sony's offer of three free games from a selection of mostly old, first-party titles doesn't even begin to compensate for the loss of an entire library of UMD games. Where are the likes of GTA Vice City Stories, Lumines, or Final Fantasy Crisis Core? "Obviously this isn't a concern for anyone new to PSP, but for the loyal owners who stuck with the console during its game drought of the past couple of years this latest news will come as a serious disappointment."